These engaging writing lessons on DVD make a superb addition to our main course for the teacher: Teaching Writing: Structure and Style. 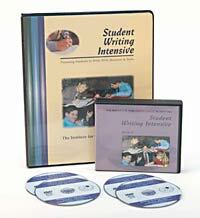 The Student Writing Intensive will last you 15-30 weeks and includes 4 DVD's of instruction for the student, a Student Notebook, and Free Lesson Plans. The Student Writing Intensive is a course presented directly to students. Comprised of four complete lessons on DVD, each session presents models and techniques from our Teaching Writing syllabus, accompanied by Lesson Plans providing additional practice between the video classes. Although familiarity with the Teaching Writing course will enhance your use of this program, it does work very well as a stand alone writing program for students. As a supplement to the Teaching Writing course, the SWI will greatly enhance parent/teacher understanding of the syllabus, while providing a humorous and energizing boost for students of all ages. For teachers, it can be used in a classroom as a jump-start for each new unit, while students who are in school can use it as an extra-currcular crash course to help them complete other writing assignments with greater ease and skill. Each group (A, B, or C, see below for grade breakdowns) presumes no previous experience and differs mainly in type of the source texts used, speed of presentation, and sophistication of vocabulary. Consequently, you should choose the level based on your child's age and maturity, rather than writing ability; and, if you wish to use the SWI with children of mixed ages, you can generally "shoot for the middle" and get excellent results. The SWI package contains four DVD discs, a binder with dividers, a packet with the resources, source texts, and checklists needed for the video classes, along with a set of three to five supplemental lessons for each of the units. The video classes alone could be completed in as little time as four days, whereas the course with the additional assignments could be stretched out to four weeks or even four months, depending on how much time is spent each day. If you would like more video instruction when you are done with one level of the SWI, progress on to the Student Intensive Continuation Course (SICC). All the SWI levels begin at the beginning, so your student does not need to do A then B then C, but rather after the SWI-A they can progress to the SICC-A. After the SWI-B they can go on to the SICC-B and so on. For whom is this course most beneficial? Perhaps our most dramatic results may be seen with reluctant writers, who can immediately enjoy Andrew's humor, reallize the process is not so overwhelming, and get started. Once they learn techniques to create a more enjoyable finished product, their concept of writing as "too hard" changes, they now have the tools for success! New! Now the Student Writing Intensive comes with lesson plans. Written by Jill Pike, these lessons suggest what portion of the disc to watch followed by several practice assignments to help the material stick. If you purchased the SWI in the past, please feel free to download these lessons and add them to your notebook. Group C: High school students. Each level begins at the beginning and covers similar writing subjects, so choose the level according to your child’s grade level regardless of writing ability. If you have several children of varying ages, shoot for the middle and choose just one or two levels to meet all your children's needs. It is also possible to use the DVD instruction from one level and supplement the instruction with the lessons plans from a younger level when teaching multiple ages. Having the Teacher's Course will make this much easier. Use all six dress-ups (stylistic techniques such as strong verbs and quality adjectives). Write simple reports from multiple references. Use all six dress-ups (stylistic techniques such as strong verbs and quality adjectives) as well as a few ways to vary their sentence openers. Write narritive stories using Aesop fables as models. Write reports from multiple references with fused outlines. Use all six dress-ups (stylistic techniques such as strong verbs and quality adjectives), six methods to vary their sentence openers, and a few decorations. Take notes on a lecture. Write a basic essay on any topic. "I have a 5th and 6th grader. We started SWI Level B today. It was a huge success. The kids loved the DVD. I watched the DVD lesson last night so I knew what was coming. I have previously watched TWSS so I have a general background of the program. Thank you so much for such an awesome program! One my kids actually can follow and love!" gradually work with my 3rd grader as I became more familiar with the system. But he heard the DVD playing and came in to watch, and he was hooked too. past, when she has been willing to write, she won't show it to me afterward. looking forward to this year." If you are live teaching this class, you may make copies of the student materials for your students or for children in an immediate family. If you will be showing the discs to your class, they should each purchase a student notebook, available for $15. Check out our special packages for schools and large groups.